There seems to be a regular pattern to cricket related chat in New Zealand. It often refers to Brendon McCullum. A number of people want him dropped. They mention that he has only scored 1 hundred in the past 3 years. That he averages in the low 30's in test cricket and that he's too arrogant. A roughly equal number of people want him to remain in the team, talking about how "form is temporary, class is permanent" and mentioning his successive fifties against England, his double century in India and his good captaincy. While engaging in one of these fruitless (but fun) discussions, I noticed something surprising in his numbers. His away form has been horrible recently, but his home form has been remarkably good. Here's what I mean. He has played exactly the same number of tests both home and away. In 41 tests at home McCullum has scored 2531 runs at a respectable average of 41.49. 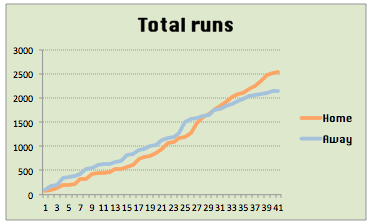 However, in 41 tests away he has scored 2153 runs at a much more pedestrian 29.90. That's a fairly significant difference, but it wasn't always like this. Up until the end of 2010 his numbers were fairly similar. It's only since then that things have changed. 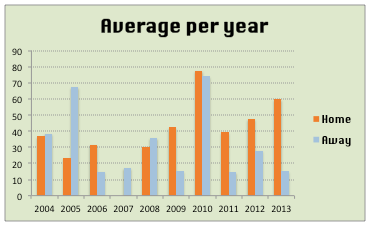 We can see that there has been a big difference in average per year at home and away from 2011 onwards. This isn't due to the teams that he has played either. In that time McCullum has played Zimbabwe, England, South Africa and West Indies both home and away, and has played against Pakistan at home, and Sri Lanka, Australia and Bangladesh away. There is no particular difference in the strength of his opponents at home and away in that time. 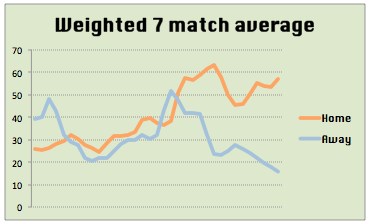 I also looked at a weighted 7 match average. This is where I look at an average for 2 games either side of a match, and 3 games either side of a match and average those two averages. It's a reasonable guide to the form that a batsman is in, and it normally covers 12-14 innings, so it is a reasonably reliable guide. Again I broke it up into home and away. 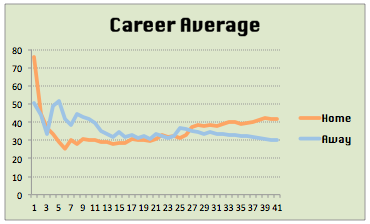 We can see here that his career was tracking along similar lines for a long time, but then they started to split. The latest weighted average is at just over 57 for home matches, and just under 16 for away matches. If McCullum was able to replicate his home form away from home, there would be no more questions asked about his place in the side. I wondered if part of the difference was due to where he batted. He has moved around the order a bit recently, and wondered if he was more likely to play in positions that didn't suit him away than at home. However I quickly checked his averages at different positions options, and found that there was a significant difference in his average at home and away for every group of batting positions. As an opener he averages 51.80 at home and 32.13 away. Batting from 3-5 he averages 37.40 at home and 30.57 away. In the lower order (6-9) he averages 41.26 at home and 27.72 away. The question then remains as to what he can do about it. How does he become good at batting in conditions he can't practice in? One option is to play a season of first class cricket as an overseas player. He has played 3 matches in his career as an overseas pro, in 2007, and was quite successful, but picked up an injury doing so. The difficulty is finding somewhere that takes overseas players, and plays their first class cricket when NZ is not playing, where the standard is high enough to be useful. Martin Guptill played second division cricket in England, and dominated, but that did not translate to his test game improving significantly. Given that he's captain, it makes it more difficult for him to be able to find time to play in England also. But that does bring another question. Is the difference due to captaincy? Are the difficulties of captaining a side on tour affecting his game? This is a difficult question to answer initially, as he wasn't captain at the start of his career when he was going well, but he also wasn't captain all the time when his away form started to dive. I first of all looked at the over all numbers, which are quite different. When he was not captain, he averaged 39.11 at home and 32.55 away. When he is captain his numbers are truly astounding. His home average is 59.85, while his away average is 15.18. However, if we just look at the matches where he was not captain since 2011, his averages are 44.30 at home and 23.50 away. It seems as if the impact of captaincy is exaggerated due to the fact that he is captain at a time where he is already struggling away from home. Also his away matches as captain have been against South Africa, England and Bangladesh. McCullum has struggled against left-arm spin at times, so Bangladesh, with 3 left arm spinners, is hardly the best tour option for him personally. (Just under half of his dismissals as a captain have been to left arm spin bowlers) Also England and South Africa are two of the more difficult places to tour. If Brendon McCullum can find his form away from home, he is capable of becoming one of New Zealand's greatest ever captains. He has at his disposal probably the most solid batting line up New Zealand has ever produced combined with what is turning into one of the most lethal opening bowling attacks ever. It may be worth playing a tour without him, in order to get him to play some serious first class cricket overseas and allow him to improve his away game.